I welcome visitors to our web page. I wanted to share with you a good mood and talk about our successes. Our company has come a long way to translate dreams into reality. 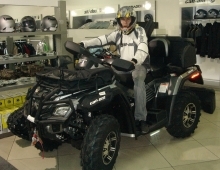 A dream was to build a hypermarket of recreational equipment, which would include all specialized vehicles such as snowmobiles and jet skis, boats with motors, clothing, accessories, service center, warehouse, so there would be no need to search around town for different parts or accessories for vehicles. The history of the development of new lines of business in our company began in 1994 when our CEO Andrey Zakharov acquired the first jet at an exhibition in Almaty. The acquisition was a bit of "craziness", then it was new, it is unclear to what and why, but we must pay tribute to Andrey, he always had a flair, foresight and courage to start new projects. The same courage I thought moving from shop of 200 square meters, where the huddled distributor division and store in a hypermarket, to an area of 2000 square meters. It seemed to me that we have no such variety of products to fill such an area. Construction and relocation coincided with a crisis, it was possible to make everything much more cheaply by cutting costs, but then we would not receive such a hypermarket. I welcome everyone to visit our hypermarket where you would be able to receive professional consultation and service in regards of specialized equipment. Marina Chapysheva – Administrator of the hypermarket. The first acquaintance with Marina was curious, she came to the office manager position, but our guys liked it immediately and they tried to persuade her to stay with us in the hypermarket to the seller, which she emphatically replied seller for nothing! But life decided differently today, we are working together to sell recreational equipment. 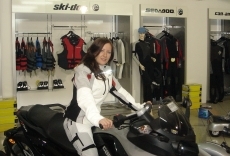 At the foto Marina wears special equipment clothing CanAm, designed for riding a tricycle. Luba Berdysheva - our accountant-cashier. It confirms the statement that the talented person is talented in everything. Luba is not an exception of that rule. 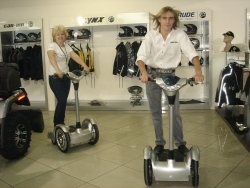 Well, what kind of salon equipment without a man - meet Kostya Glazov our consultant seller. He with characteristic thoroughness can explain the most difficult question simply and clearly. Our team and me waiting for you in our hypermarket, six days a week from 10 am to 19 pm where we would be glad to answer any questions you would may have on our products and service. Telephones: + 7 (727) 315 05 05, 315 07 07, 277 33 77.